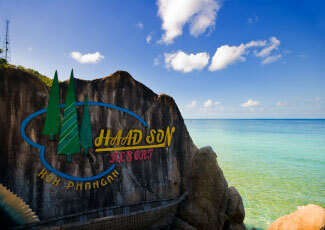 Haad Son Resort is located on their own secluded white sand bay on the popular sunset coast of Koh Phangan. The resort has been established for nearly a decade and the rich tropical gardens and wonderful natural surroundings have matured with time, harmonising with the environment and creating a special private paradise. 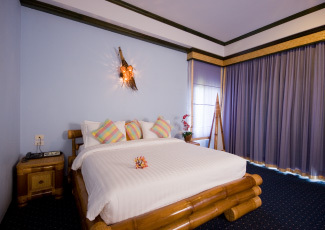 The resort has a great variety of accommodation options with the emphasis on style and quality; from island style huts to luxury air-conditioned villas. Haad Son Resort prides itself on its great service and friendly family atmosphere, so no matter what room you choose, you are guaranteed to enjoy your stay at this most luxurious and beautiful location. The beach of Haad Son is one of a very few on the Island which has remained virtually undeveloped and it presents a perfect picture of an idyllic desert island cove. The resort occupies the north end of the beach whilst the central and southern areas are completely uninhabited, leaving a 300 metre long stretch of virgin white sand fringed with tall shady coconut palms. A live coral reef vibrant with mesmerising corals and amazing tropical marine life lies about 70 metres from the shoreline, providing an easily accessible gateway into the fantastic underwater world of scuba diving and snorkelling. Either side of the broad beach, huge granite formations form protective arms around the cove, cutting it off from the neighbouring beaches and adding to the feeling that it is your very own private bay! Over the years Haad Son Resort have gradually added new buildings to their resort, resulting in a great variety of well-maintained new or nearly new bungalows that are either right on the beach or positioned on the hillside so that all have wonderful sunset sea views. There are 57 rooms in total, all coming with en-suite bathroom and in numerous styles providing a great variety of accommodation options. 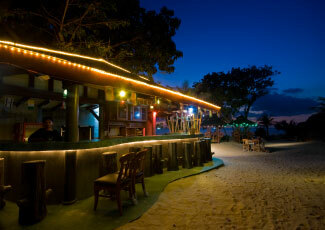 Ranging from Island style huts with fan for the budget traveller up to air-conditioned bungalows with twin double beds, min-bar, hot water and UBC satellite TV for those who want to live it up a little. Although there are many rooms, care has been taken to ensure that the wonderful natural beauty of the area remains and the bungalows have been positioned so as to blend in with the landscape and rich tropical gardens. Now available are 4 luxury Executive Penthouse Suites each with stunning views and private balcony, situated around a unique jacuzzi swimming pool. 12 of Garden Villa:Standard Room 24 sq.m. with 1 Double Bed, Air-Con and Hot Shower. Max of 2 adults and 1 child. 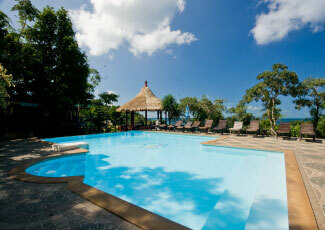 4 of Garden Villa:Superior Room 24 sq.m. with 2 Double Beds, Air-Con, Hot Shower, Cable TV and Mini-Bar. Max of 4 adults. 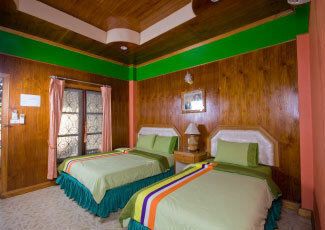 24 of Beachfront Hotel:Deluxe Room 24 sq.m. 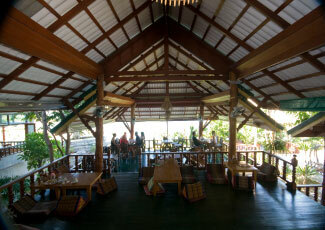 with 1 Double Bed or 2 Single Beds, Air-Con, Hot Shower, Cable TV and Mini-Bar. Max of 2 adults and 1 child. 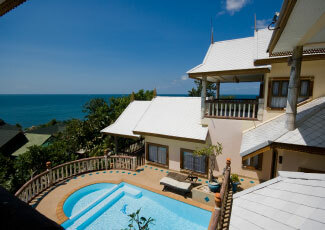 8 of Ocean Villa:Deluxe Bungalow 24 sq.m. with 2 Beds(1 Double Bed + 1 Single Bed), Air-Con, Hot Shower, Cable TV and Mini-Bar. Max of 3 adults. 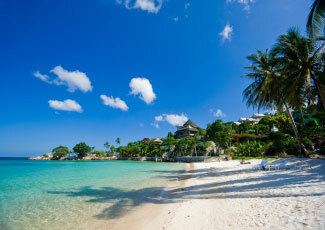 5 of Beachfront Villa:Deluxe Bungalow 24 sq.m. 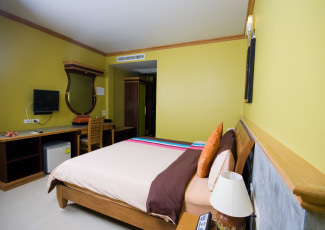 with 2 Beds(1 Double Bed + 1 Single Bed), Air-Con, Hot Shower, Cable TV and Mini-Bar. Max of 3 adults. 4 of Executive Penthouse Suite 32 sq.m. 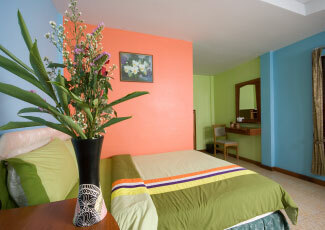 with 1 Double Bed or 2 Single Beds, Air-Con, Cable TV, Mini-Bar, Bath Tub and Hot Shower. Max of 2 adults and 1 child. 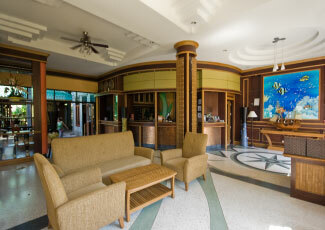 Free Wireless Internet available at the lobby, pool and restaurant area.